‘The past is a foreign country; they do things differently there’ – Or perhaps they don’t. The iconic opening line from L. P. Hartley’s 1953 novel, The Go Between, has come to encapsulate the way many of us think and feel about the past. Whether it is the ninth or the nineteenth century that we look to, the same temptation confronts us; to explain the past as a place intrinsically different from our own, and its people as individuals fundamentally different to ourselves. Whilst these sentiments may hold true for some of the most visible elements of any age – technology or social customs – other elements of the past often provide a striking mirror in which to examine our own lives and societies. The history of offending and offenders is one such mirror. In some ways, Victorian England’s female offenders did live in a foreign country. One where employment opportunities, living standards, and state intervention took a very different form to those of the twenty-first century world. However, should their social and personal lives be assumed so very alien to our own? Perhaps the uncomfortable truth historians must acknowledge is that, in the course of their lives, many wayward women and their families met with the same situations, difficulties, and discrimination that a number of vulnerable individuals and groups face in Britain in the present day. Mary Brennan’s life and slide into offending offers one such example. Home Office and Prison Commission: Female Licences; Class: PCOM4; Piece: 61; Item: ;. Page: 40. Mary Brennan was born in Cheltenham, Gloucestershire in 1850, the daughter of John and Jane Brennan. The Brennan’s were originally from Scotland, but moved around England during Mary’s early life, due to John’s work as a travelling acrobat. The Brennans were a large but close family. Mary was one of the youngest, only she and her brother John junior remained at home by 1861. John Brennan made money enough for the family to be solvent without his wife Jane having to work, and for his children to attend school. This happy and stable life was shattered in the early 1860s. The family had been lodging in Westminster, London, when John unexpectedly died. The Brennans lost a father, husband, and head of the family. Even more devastatingly, they had lost an economic lifeline. Employment for unskilled women in London was not abundant. Jane was only eligible for the lowest paying and most menial jobs, such as charring or laundering. On such a scant wage, in a period where the only state relief available was the workhouse, Jane was unable to sustain supporting her family. With some of Jane’s older children already moved on and married, and her oldest son off working as a travelling performer, the family unit crumbled. Fourteen year old Mary Brennan found herself cut adrift from her old way life. Like many young teens suddenly without an authority figure, Mary found herself immersed in a new way of existence, fraught with as much danger as there was opportunity. By the age of fifteen, perhaps out of economic necessity, perhaps out of camaraderie for her new peers – a group of three or four ‘street girls’ of a similar age and economic stance to Mary – or simply out of a need for attention; Mary had been arrested and sentenced to a year in prison for loitering on the street, drinking and picking pockets. Without the money or personal connections needed to reinvent herself, Mary’s life course was irrevocably altered by the time of her release, aged just sixteen. After her months in prison, Mary did not return home to her mother, who was still living in London. Mary began cohabiting with a petty offender five years her senior – Francis Knight. No doubt the older and independent Francis seemed an attractive proposition to a young girl with nothing. 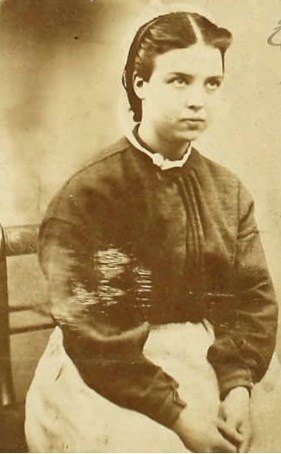 Mary and Francis never married, but by the age of eighteen Mary had given birth to two of his illegitimate children – Jane in 1867 and Francis in 1868. These developments further solidified Mary Brennans transition into a life of offending. In the few years she spent living with Francis Knight, Mary was frequently in the police courts, and in and out of prison several times for various street offences such as drinking, assault and theft. 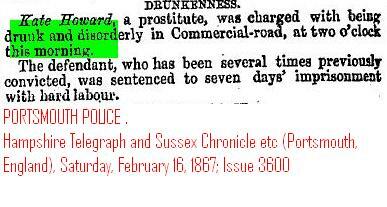 Mary had also gained the infamous label of prostitute. 1869 was another turning point in Mary’s career of offending. By the age of nineteen she had become notorious with the police and magistrates, so when she was discovered stealing £10 in bank notes from a dwelling house in December that year, the court had no hesitation in handing down the maximum sentence for an ‘old’ offender. Seven years penal servitude. Her relationship with Knight disintegrated during her sentence – imprisoned for seven years, she was no longer of any use to him. In the mid 1870s after her discharge from prison, Mary formed a new relationship with another offender, Thomas Lawrence. Mary Brennan had been living a transient life of repeat offending for longer than she had spent as a member of a stable working family in the time before her father’s death. It is perhaps unsurprising that Mary was thoroughly entrenched in her current mode of life, and that on each release from prison her life of vice resumed. 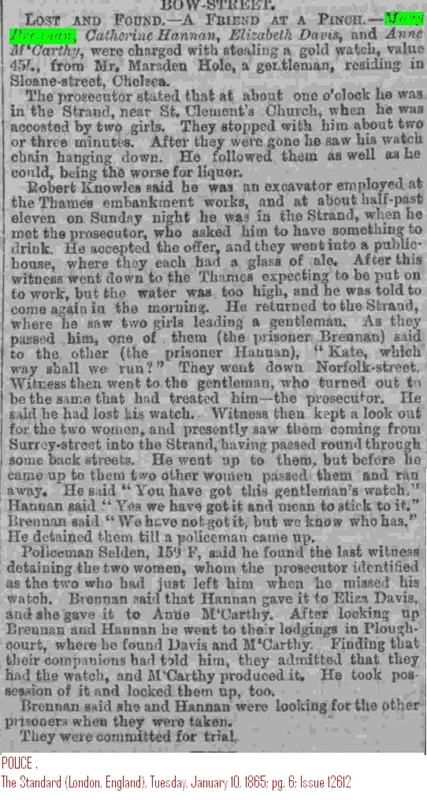 In December 1881 Mary was again brought up at the Middlesex Sessions, charged with stealing £5 from the person, and sentenced to five more years penal servitude. As Mary entered her late thirties and early forties, the cycle of offending, conviction, release and repetition resumed. While some elements of Mary’s story are unique, and some of her difficulties and decisions were facilitated by social and cultural infrastructure that no longer exists, other aspects of her story highlight causes and contributions to a life of deviance and offending that are a product of the modern world; poverty, lack of early stage state support, and a punitive, ineffective, prison system. The past is not a foreign country, but a neighbouring one. A place with which, it may be time to concede, we share a little too much socially, culturally, and politically. The people of the past still needed to eat and pay for housing, just as many struggle with today. Then, as now, people might find their lives spin out of control after life traumas such as bereavement and the disintegration of the family unit. Teenagers then, as now, still longed for independence, rebelled or were mislead by peers, often paying a high price for their transgressions. People in the past, just as now, were capable of making impulsive decisions – the consequences of which could last a life time. When it comes to offending, perhaps it is most important to acknowledge that the lack of understanding and level of stigmatisation we see so clearly ruining lives in the past, continues to do so today. Attempting to retrace and recover the lives of Victorian England’s female offenders is both a rewarding and challenging endeavour. This kind of research presents the opportunity to uncover new facts relating to offending, more in-depth details with which to enrich current histories of crime and those who commit it, and ultimately it can offer a fuller picture of who offended, and why. Unfortunately, the process of finding information – and particularly correct information – about Victorian offenders is not always as smooth as it might be. For a start most offenders in the past, as in fact now, often made a concerted effort to ensure that they left no incriminating evidence of, or record about their offending. When offenders were given no choice in the matter of having some evidence created (such as a court transcript, or a criminal record, or prison form), they could also seek to obscure real and relevant information being held for posterity. Quite simply, just because someone in authority asked a question of them, it did not guarantee a sensible of accurate answer. Of all the female offenders that the Victorian city can offer for study, prostitutes are the group that most suffer from this lack of sufficient and useful evidence. The case of Lydia Lloyd proves a fine example of this. Image: Home Office and Prison Commission: Female Licences; Class: PCOM4; Piece: 71; Item: 5; Page: 1. 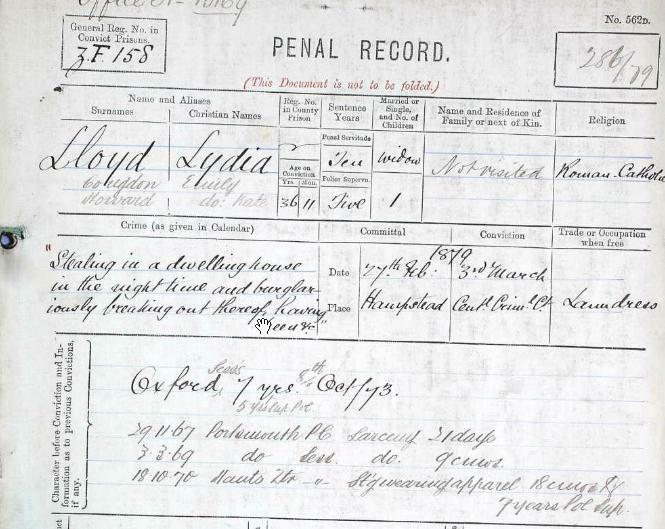 From this record we can tell certain things about Lydia Lloyd – that she was repeatedly convicted on counts of larceny from 1867 – 1879, aged between twenty-five and thirty-six. 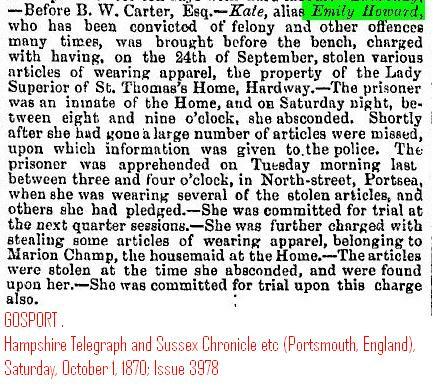 Lydia Lloyd may not have even been her name – she had previously been convicted under the names Kate Howard, Emily Howard and Emily Cougdon. She had moved around the country. 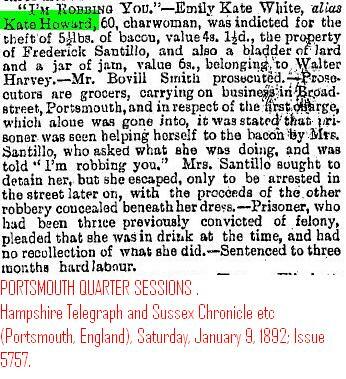 We can also tell that this offender worked as a ‘laundress’ in 1879, and sadly that no-one came to visit her during her ten year imprisonment. It seems that this offenders ‘mode of living’ for the majority of her life was what social investigators might term ‘irregular‘. It would appear that her real name (or at least her original alias) was Emily Howard, which later changed to Kate Howard – Lydia Lloyd being an alias she took on when she moved to Oxford after she had already been offending for ten to fifteen years. She was drunk, disorderly, light fingered, living a life of ‘no fixed’ address, and prostituting herself – from at least the age of seventeen. During this period her offences escalated from a few days remand for using obscene language in the street, to ten years in prison for burglary as a known offender. With this extra information it is much easier to get a feel for Lydia, her offences, and her lifestyle. This makes it possible to track down other offences she may have committed – and perhaps to begin creating a narrative of the kind of existence she may have led. The historian’s traditional method for doing this is to speculate on the most likely scenario by combining the information from this specific case with the wider historical knowledge and evidence existing on prostitutes as a group. Unfortunately, where the Victorians are concerned, the discussion and documentation of prostitution and prostitutes posed some huge ideological problems. Whilst prostitution was considered by many as a necessary evil, prostitutes embodied antithesis of the period’s ‘ideal women’ (the meek, maternal and obedient middle-class wife and mother). 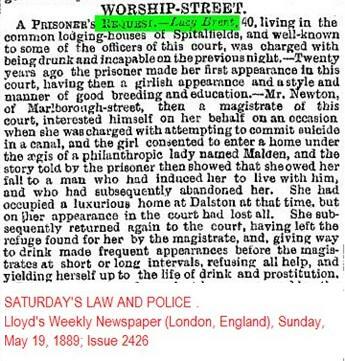 The very existence of prostitutes such as Lydia Lloyd challenged ideas about the natural morality and sexual passivity of women – and thus Victorian commentators had to provide not just damnation of these abominable women, but more importantly an explanation for their existence. The same familiar trope of the tragedy of seduction and lost innocence, the cry for help, the lack of salvation, the steady decline into vice, and last – the sad reality of total personal and moral corruption. Undoubtedly for some, this narrative would have been very close to the reality of their experience – yet surely for others it holds no more truth than the invention of a happy ending. So should the historian even attempt to fill in the blanks, and attempt to solve a problem like Lydia Lloyd? Is there more damage to be done in assigning someone a background that does not belong to them, than there is in not assigning them a background at all? It would seem that by trying to locate Lydia Lloyd in the same past as ‘similar offenders’ from this period, thus defining her life by her offences rather than the other way round, there is a real risk of offering her no more narrative justice than she received at the hands of her outraged contemporaries. A Growing Class of Offenders? Image: Home Office and Prison Commission: Female Licences; Class: PCOM4; Piece: 59; Item: 6; Page: 2. In 1882 Liverpool Echo published this article, lamenting the growing number of violent assaults committed by women, against women in the city. In Liverpool, as elsewhere in the country, the ever present spectre of female deviance both upset the sensibilities, and captured the imagination of Victorian men, women, and children alike. Whether it was Charles Dickens’ fictional tragic moll Nancy at the beginning of the era, or the ghoulish real life serial killings of the ‘Black Widows’ towards the end of the century. Those fascinated with crime, then as now, perceive a somewhat contradictory being when they call to imagination the idea of a Victorian female offender; Lascivious, immoral, scheming, lazy and dishonest – yet at the same time almost a victim, a weak and passive creature corrupted and invariably led into vice by their iniquitous male counterparts. The nineteenth century woman who committed crime was and is all too often represented as either the tragic heroine or dastardly villain of her own story. However, these melodramatic roles are very rarely ones occupied by real people navigating everyday life. 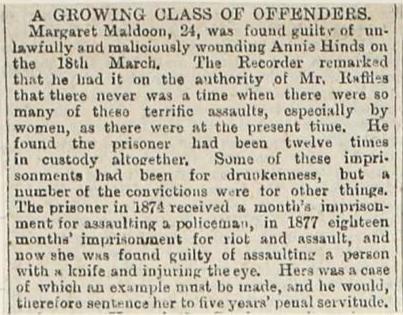 Rather than being a homogeneous ‘class of offenders’ that could be easily identified and profiled, Victorian female offenders were in reality a diverse collection of individuals. A fact reflected in both their backgrounds and their crimes. Some came from the depths of poverty, others from a world of luxury and privilege. Some had immigrated to England in hope of a better life, whilst some had never ventured further that the street they were born in. To some, crime was a career and their offences numbered in the hundreds, others offended only once. Women experienced both reform and relapse at the hands of Victorian policing and punishment. Female offenders were thieves, housebreakers, pickpockets, fraudsters, coiners, prostitutes, brothel owners, drinkers, fighters, murderers, and more. Yet at the same time they occupied lives as workers, friends, outsiders, orphans, partners, daughters, mothers and sisters. They were women with hopes and aspirations, fears and responsibilities. Leading real lives and making real, and difficult decisions. By combining the two worlds which many women straddled – the criminal and the personal – it is possible to get a better idea of the real women behind the Victorian myth of female crime, and to pursue the tantalising answers to the who, what, and why of offending.